For the wicked problem that needs an innovative solution, there is now Twoor.com on demand innovation platform to create engagement towards solving that wicked problem. For the business leaders that need to increase revenue, open a new channel, or create a new business model, there is now a way to engage employees, customers and other partners into an Innovation Challenge. Built by experts, the platform incorporates the lessons from decades of innovation experience. 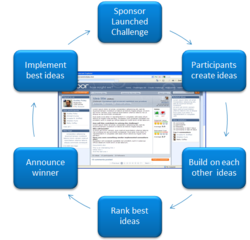 This entry was posted in Which Open Source Blog and tagged Business, Challenge, Coinnovate, Community, Customers, Effective, Employees, Innovation, Leaders, Offers, Platform, Suppliers, Twoor.com, Users on February 21, 2013 by Administrator. Members and guests of the NAPW Greater Memphis, TN Local Chapter gathered for professional networking meetings in October and November at the Southaven Library. The group of professional women welcomed new members and continued to increase its presence in the community by helping out a local food bank and focusing on other ways to give back to those in need. We are continuing to grow and work towards increasing our presence in the community, said NAPW Greater Memphis Local Chapter President Onika Shirley. We will continue to seek areas where the Chapter can be present and of assistance to others. During the October 6th meeting, Onika welcomed all of the attendees to the networking event and introduced the two latest members in attendance to the rest of the group. Please give a very warm welcome to our newest members, Qualice Seymour and Wanda Banks, said Onika. Both of these women are a wonderful addition to the Greater Memphis Local Chapter. Qualice Seymour is currently employed at FedEx Services as a Senior Sales Specialist supporting the domestic sales organization. 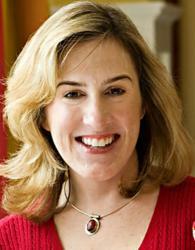 She is the Author of Be Found Virtuous. Qualice is also the Owner of a women’s empowerment ministry, Be Found Virtuous Ministries. Her organization seeks to help women and young ladies build character and raise self-esteem one virtue at a time. Wanda is a Registered Nurse Case Manager at the Regional Medical Center at Memphis and Visionary/Executive Officer at Garment of Wholeness. She is drawn to and passionate about empowering women to achieve destiny. Wanda announced and shared some information on the grand opening of Shekinah Glory Empowerment Center. The mall for empowerment is a part of the three-fold vision of Garment of Wholeness Ministries. Onika announced that the Chapter is still collecting for the Mid-South Food Bank and has tentatively planned to make the donations to the organization in December. She invited members to continue to collect and donate whatever they could. We have already collected canned goods and monetary donations, said Onika. We encourage monetary donations since the food bank is able to get more for the money. For example, for every dollar the food bank collects, it is able to purchase $ 4.00 worth of food. Onika announced that there is a number of Chapter Board positions open, including: Secretary, Event Planner, Fundraising Planner, New Member Welcome Committee, and Treasurer. The October meeting was also the first time members took turns bringing snacks. This proved to be successful and attendees enjoyed wonderful snacks and drinks. Attendees at the October networking meeting were: Onika Shirley, April Davis, Taffy Baron, Kris Seiler, Lisette Jones, Wanda Banks, and Qualice Seymour. The NAPW Greater Memphis Local Chapter met for another networking event on November 23rd. Chapter President Onika kicked off the meeting by welcoming everyone and thanking them for attending. The meeting focused on discussing how the Chapter can become more involved in volunteering for and participating in different community-based activities. The Chapter President first discussed the Chapters Mid-South Food Bank Contribution. Onika reminded everyone that all canned goods and monetary donations collected will be donated to the food bank in December. Members of the Greater Memphis Local Chapter have given graciously and I thank everyone for all they have done so far, said Onika. Member Kris Seiler volunteered to look into dates and schedule for volunteering during the St. Jude Memphis Marathon Weekend. Onika discussed themes for celebrating International Womens Day in 2013. One idea that was suggested was for us to have a cluster meeting where we will meet with other NAPW Local Chapters to celebrate this important upcoming event, said Onika. The group of professional women also decided to team up with organizations that are focused on identifying, developing, and resourcing the assets in each community. Together, we will foster environments where relationships are formed, strengths are empowered, and where the love of Jesus is present, said the Chapter President. The women also discussed information about the 2012 Holy Convocation that is scheduled for November 5th through November 13th in St. Louis, MO. As members enjoyed snacks donated by other members, the group also chatted about some new things that they wanted to try, including a free mobile application that allows groups to text message. We signed all the attending members up for GroupMe, said the Chapter President. We are using this as a quick communication tool to get a quick word out via cell phone. For the Chapters upcoming December holiday blast, each member agreed to bring a dish to celebrate the holidays and the Chapters final meeting of 2012: April-meatballs, plates, and forks; Onika-chesse ball, drinks, and napkins; Taffy-cake; Chris-casserole of some sort and grape salad; Verna-other. Members agreed to continue meeting at the current location unless there is an event that will require an alternative meeting location and different day of the month. The Chapter will continue to meet on the first Saturday of every month at 2:00pm unless otherwise noted. Attendees at the November Greater MemphisLocal Chapter meeting were: Onika Shirley, April Davis, Taffy Baron, Kris Seiler,and Verna Nickelberry. The National Association of Professional Women (NAPW) is the largest and most recognized network of female professionals. NAPW provides a forum where women can interact, exchange ideas, educate, network, and empower. NAPW Local Chapters allow members to maximize their experience through meetings, networking opportunities, and professional events. For additional information regarding the NAPW Greater Memphis Local Chapter and/or NAPW, please visit http://www.napw.com. Follow NAPW on Facebook and Twitter. This entry was posted in Which Open Source Blog and tagged chapter, Community, Greater, Increases, Meetings, Membership, Memphis, Monthly, NAPW, Networking, Presence, Through on February 6, 2013 by Administrator. This entry was posted in Which Open Source Blog and tagged Access, Applications, Automated, Calais, Capabilities, Community, Debuts, Developer, Development, Generation, Metadata, Open, OpenCalais.com, Rapid, Releases, Reuters, Semantic, Service, Supports on February 5, 2013 by Administrator. Online sellers in the Webnode community have increased in number for the past few months. This fact is based on the numbers of users signing up for Webnode, and using their websites for the purpose of online selling. The Chatwing team, resourceful as ever, has used this fact as a template for their new global chat box. This new chat app is known for its global connectivity and social media advantage. It has also been used in different blogging communities such as WordPress and Posterous. Online sellers can take advantage of the Chatwing shoutbox because it offers social media integration. Through this option, Chatwing users and visitors can log in with their Facebook or Twitter accounts. If the blogger wants to expand his social network, he can always send invitations to his blog visitors. In this way alone, Chatwing provides a stream of communication that is crucial to any purpose. Before expanding to blogging communities, the Chatwing team has undergone several platform tweaks. These developments were created in rapid succession in order to deal with the influx of visitors and registered users. During the first wave of expansion, the Chatwing shout box has already gathered thousands of sign-ups, yet the team is expecting for more in the future. In the latest version, the Chatwing tool can accommodate up to 600 users. The dev team is planning to upgrade it to 1000 to help more users gain proper communication leverage. The Chatwing team aims to go beyond the reach of other chatrooms by working on the chat platform with 100% diligence and determination. To keep the customer satisfaction rate intact, the developers are willing to work round the clock in upgrading the chat application. Additionally, the Chatwing team will always empower the premise of website chat so that people will be more aware of its importance. 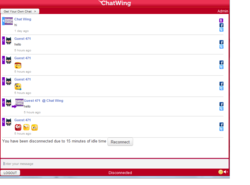 Chatwing.com has developed live chat software for websites and blogs. It caters to different online communities due to its high rate of connectivity. Everyone can create a customizable live chat box feature in 1 minute or less. Users have the ability to customize the size, color, and fonts of the chat product. The ability to chat via social media accounts such as Facebook and Twitter enable Chatwing to offer a personal and unique real-time experience to all sites. Chatwing is 100% free and very easy to use. This entry was posted in Which Open Source Blog and tagged Chat, Chatwing, Community, Global, Online, Potent, Releases, Report, Sellers, Webnode on January 25, 2013 by Administrator. BizFilings, a leader in online incorporation, is pleased to announce todays relaunch of Business OwnersToolkit (now at http://www.BizFilings.com/toolkit; formerly at http://www.toolkit.com), a new and improved website providing small business advice, articles and resources for small business owners. Toolkits free educational content includes more than 3,500 small business articles for small business owners (both current and aspiring) about starting a business, keeping a business running, handling rules and regulations, managing employees, and more. Toolkits relaunch creates a true one-stop for comprehensive small business resources that will assist small businesses and entrepreneurs. While utilizing the small business expertise of BizFilings, Toolkit is a part of the Wolters Kluwer family of business, and as such also has the backing of brands such as CT Corporation and CCH. This connection allows access to a greater breadth of available information for small business owners providing expert advice on topics such as legal and compliance issues as well as taxes and accounting. Above and beyond providing a wealth of small business articles, the new site also has engaging interactive elements for small business owners. With features such as Ask Toolkit (in which entrepreneurs can ask a question and get a response from the Toolkit team of expert business advisors within a few business days), free Podcasts and free Tools downloads and templates, Toolkit has something for everyones business needs. Toolkit also offers a comprehensive Small Business Guide, with sections that cover every step of the entrepreneurial process highlighting frequently asked questions and common stumbling blocks. Toolkits reporting will also provide in-depth features about pressing business issues and opinion pieces about current events in the business world. While BizFilings is still the go-to place for online incorporation and information about business needs, we feel as though Toolkit is a great additional resource for small businesses, says Karen Kobelski, member of the executive leadership team at BizFilings. Were thrilled to be able to provide free small business advice, information, tools and guides for entrepreneurs and a community for them to learn from as well. Starting today, small business owners and those interested in learning more can use Toolkit as their one-stop for small business resources. For more information, visit http://www.BizFilings.com/toolkit. BizFilings is a full-service, online incorporation service provider, offering small-business owners a fast, easy and economical way to form a corporation, limited liability company (LLC) or other business structure online or by phone. BizFilings also offers a full range of business filing and compliance products, including nationwide Registered Agent Service, helping keep businesses in compliance with state regulations. BizFilings is a part of Wolters Kluwer Corporate Legal Services, a business of Wolters Kluwer, a market-leading global information services company. Wolters Kluwer had 2011 annual revenues of 3.4 billion, employs approximately 19,000 people worldwide and maintains operations across Europe, North America, Asia Pacific and Latin America. Wolters Kluwer is headquartered in Alphen aan den Rijn, the Netherlands. Its shares are quoted on Euronext Amsterdam and are included in the AEX and Euronext 100 indices. Visit our website or YouTube channel, follow @Wolters_Kluwer on Twitter or look up Wolters Kluwer on Facebook for more for information about our customers, market positions, brands and organization. This entry was posted in Which Open Source Blog and tagged Announces, BizFilings, Business, Community, Comprehensive, Owners, Relaunch, resource, SmallBusiness, Toolkit on January 16, 2013 by Administrator. Harry Patel, the owner of Mywitney.co.uk, wanted a website that would serve as a directory on Witney, allow local people to interact through a variety of community building/ value adding functionalities, and allow them to catch-up on local news and events. Importantly, Harry also wished to manage the site himself and of course for it to generate revenues. the first Pigtail Pundits – one of India’s leading interactive agencies – set about to do was to architect the site, which would enable mutual value exchange with visitors and offer an enhanced user experience. After a thorough understanding of visitors needs and expectations, the team at Pigtail Pundits decided to make the user experience memorable, by introducing design and usability to a mix of local news, business services and strong community services. Whats more, the client in London, was thoroughly trained on the system using a combination of Flash Tutorials, Help Files and email. The MyWitney.co.uk portal is built entirely on Open Source tools. It features, Joomla Content Management System, Zoom Media Gallery, JoomlaBoard, Poll, Yahoo Weather, an alphabetical Business Directory, Event Listing, Google Adsense and Ad Banner Manager and Tracking system. This entry was posted in Which Open Source Blog and tagged Being, Came, Community, Interactive, Into, Online, Oxfordshire, People, Witney on January 6, 2013 by Administrator. Gold Lasso, LLC, a leading provider of on-demand email marketing software and services, announced that it has launched Dot Email (http://www.dotemail.com), a new, free online community for email marketers. The website was built to serve the professional needs of today’s e-marketers, and in keeping with Gold Lasso’s open source roots, Dot Email was created entirely with open source software such as Joomla and related components. Dot Email features detailed resource links, message boards, links to industry news, blog commentaries, file sharing and job and marketplace sections. A sample of the issues already being discussed at Dot Email includes the potential impact of Internet video on marketers in 2007. A recent study by the media research firm Horowitz Associates reveals that Internet video content is grabbing more mobile device users all the time, with eight percent of all Internet users reporting they watch video content on a handheld device at least once a month. How will this growing trend impact email marketers in 2007? Early users of Dot Email are already sharing opinions on the most successful methods for packaging an email that is linked to video content in order to boost viewers. Other issues that will surely impact the way marketers use email in 2007 are email deliverability and the continued growth of online ad spending. Gold Lasso, LLC, located in Gaithersburg, MD, is an interactive technology marketing firm that started operations in 2001. The company primarily services the association, publishing, retail, education and hospitality industries. For more information, visit the Gold Lasso Web site at http://www.goldlasso.com or call 301-990-9857. This entry was posted in Which Open Source Blog and tagged Community, EMarketers, Online, Open, Visitors, Welcoming on January 5, 2013 by Administrator. Energetica, IT consultancy specialist in the not-for profit sector, together with Australia’s The Spastic Centre, have developed and launched four innovative blogs designed to provide a voice for people living with cerebral palsy (CP) at http://www.cpblogs.org.au. Energetica’s Director Lisa Harvey said the launch of the blogs will be significant in raising awareness and improving the understanding of CP in the community. “I am hoping that the powerful stories of peoples’ lives told on the blogs will create a sense of community around the bloggers and provide an insight into the difficulties and joys of people living with a medical condition. The bloggers will be talking about their real lives and will provide an insight into how people live with CP,” said Energetica’s Lisa Harvey. Energetica was engaged by The Spastic Centre to plan the structure and technology for the blogs along with constructing the CSS templates. Energetica also tested the tools for accessibility with people who have cerebral palsy. This was an important part of the process as the management tools had to suit people who have some physical difficulty using computer technology. “All of the technology used by Energetica for this project was open source. We used the Joomla! Content Management System to build the four sites, with the Myblog and Jomcomment components. This adds blog style content functionality so that they can be easily managed from the front end. RSS, social bookmarking and other tools are all supported as are the multiple bloggers,” said Energetica’s Lisa Harvey. The blogs provide a mechanism for people to share information and tell their stories. There are two blogs written by people with CP. One focuses on the web and technology, and the other shares very real social experiences of life with CP. The third blog, written by a father of a child with CP, offers a compelling, family perspective on living with a disability. Each of these people have different approaches to life and a different outlook to living with CP. The final blog is written by staff at The Spastic Centre sharing news, activities, events, websites and classifieds for people with CP and their families. The project commenced in 2007 but was delayed due to the fire that devastated The Spastic Centre administration building before Christmas. Visit the blogs developed by Energetica for Spastic Centre at http://www.cpblogs.org.au. Energetica provides IT advice, strategy and web-based technology to the not-for-profit community and helps organisations build their IT capacity and manage it into the future by understanding the unique requirements of not-for-profit community-based, member-based organisations and SMEs. Energetica works with SMEs, peak bodies, trade unions, charities, associations and community organisations. The Spastic Centre was one of the first organisations of its kind in the world. It was started in 1945 by two parents, Neil and Audrie McLeod, who had a daughter with cerebral palsy (CP). Together with a small group of families they developed services and programs for children and adults with CP. Today, The Spastic Centre delivers essential services across 70 sites in NSW and the ACT. Cerebral palsy affects movement, and is the result of damage to the developing brain, usually before birth. It is the most common physical disability in childhood. One in every 400 babies born in Australia will have cerebral palsy. Babies most at risk of CP are those born prematurely or with low birth weight. Globally, the incidence of CP has not declined despite advances in medical technology. This entry was posted in Which Open Source Blog and tagged Awareness, Blogs, Cerebral, Community, Energetica, Innovative, Launched, Palsy, Raise on January 3, 2013 by Administrator. Green Leaf at Hermitage Apartments, Nashville Apartment Green Leaf at Hermitage, an affordable apartment community in Nashville, is about to increase its customer base by reaching a wider audience. Known for combining the vintage elegance of the city’s rich history along with the finest in customer service and quality, Green Leaf at Hermitage Apartments is a member of the family of apartment rental communities, Green Leaf Partners Green Leaf Partners. Green Leaf Partners consists of several apartment rental communities that elegantly combine the allure of exotic locales with modern design aesthetics. From the redesigned Green Leaf at Broadway Apartments http://greenleafbroadway.com to the upgraded Green Leaf at Killian Hill Atlanta Apartment Green Leaf at Killian Hill located in The city of Snellville located in Gwinnett County, Georgia, roughly 20 miles northeast of the Atlanta metropolitan area, each member of the Green Leaf Partners family of apartment rental communities. Green Leaf Partners are also proud to announce that they are rolling out the “Go Green” program at all of their properties around the country. Energy efficiency has always been a major problem for older, garden-style apartment buildings. To address this issue, Green Leaf Partners have been working to develop a strategy that will better the lives of their residents, and the planet. Green Leaf Partners see’s this strategy as having multiple benefits: They will help the environment by creating buildings that use less water and energy. They will save residents money on their utility bills and create goodwill in the community. This entry was posted in Which Open Source Blog and tagged Acquires, Apartment, Community, Green, Leaf, Network, Partners, Rental, Sites, TurnAroundMedia.com on January 2, 2013 by Administrator.